Franklin Performing Arts Company (FPAC) celebrates the holidays with three festive productions. Ring in the season with Tchaikovsky’s timeless ballet The Nutcracker, FPAC’s original musical Humbug!, and A Glass Slipper Christmas, a holiday panto with a twist on the Cinderella fairy tale. FPAC’s magical journey of The Nutcracker will be presented at the Franklin High School auditorium on December 3 at 7:30 p.m. and December 4 at 2:00. 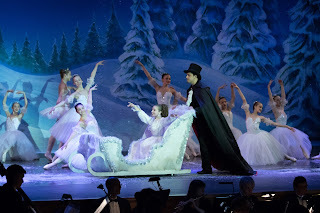 A popular FPAC holiday tradition for more than 20 years, the production features guest artists Vilia Putrius and Mindaugas Bauzys, company dancers with Festival Ballet Providence, as the Sugar Plum Fairy and her Cavalier. Rosario Guillen, a student of the Boston Conservatory at Berklee, will dance the part of the Nutcracker/Prince, with Aaron Andrade of Lincoln, Rhode Island, playing the role of Dr. Drosselmeyer. Set to Tchaikovsky’s beloved score, the world-famous ballet showcases more than 100 area dancers and features a 27-piece professional orchestra under the direction of Peter Cokkinias. FPAC’s original panto, A Glass Slipper Christmas, will be staged at THE BLACK BOX on December 9 and 10 at 7:30 p.m. with a Sunday matinee on December 11 at 2:00. Based on the story of Cinderella, the production follows in the British tradition, retelling a well-known fairy tale in an exaggerated style filled with audience participation, popular music, slapstick comedy, jokes, dances, and more. Audiences are invited to cheer for the hero, boo at the villain, and sing along to favorite songs. The panto also entertains with double entendre, references to modern culture, and open satire of other works. FPAC’s large-cast holiday musical, Humbug!, will be presented on December 17 at 7:30 p.m. and December 18 at 2 p.m. at the Franklin High School auditorium. A family favorite since debuting as part of the company’s 2008 season, Humbug! is an original musical retelling of Charles Dickens’ A Christmas Carol. With musical hits of every genre and live accompaniment by a 10-piece band of professional musicians, Humbug! transports audiences from Dickensian England to contemporary America as the novel’s iconic characters and storyline are cleverly reimagined with modern setting and dialogue. Humbug! stars the script’s writer, Nick Paone, as Ebenezer Scrooge. For more information or to purchase tickets, call (508) 528-3370 or visit www.FPAConline.com.